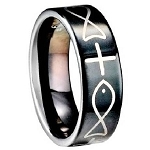 This tungsten ring features short inlaid crosses around the outer edge of the ring. The high polish finish and comfort fit interior make this a superior looking ring. 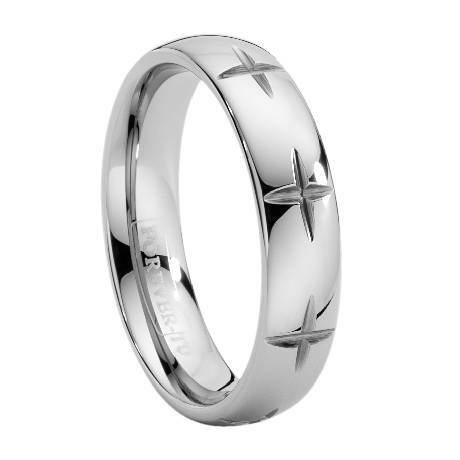 Tungsten rings are high quality and rarely scratch. Comfort fit tungsten rings usually run 1/2 size larger, it is suggested you buy a half size smaller than your standard ring size. We recommend having your finger measured for a comfort fit ring at your local jewelry store for an accurate fit. All of our tungsten rings come with a lifetime warranty. First let me start by saying that the customer service is fantastic, and the ring, well my husband and I love it. Don't hesitate to make a purchase from here. 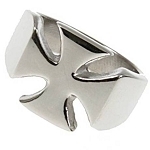 Many thanks The Mc Lester's..
Everyone really likes the look of Cross Engraved ring including myself. Delivered quickly and the correct size. Would recommend everyone looking for a ring try JUSTMENRINGS first also the price was great.